You can donate online on our Virgin Money Giving page by clicking on the image. 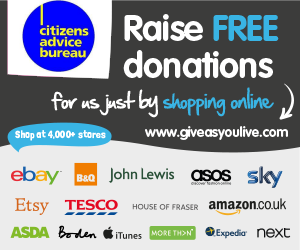 If you shop online, why not raise a free donation for us at the same time! Just go to Give as You Live, click on Join Now and follow the simple steps. Select ‘South East Staffordshire CAB’ as your chosen charity. Then shop ‘til you drop! We’ll receive a commission from every purchase, at no cost to you.